Android pay is new mobile application developed by Google. To use this app your smart phone must be NFC enable with operating system Kit Kat 4.4 or above. You can download this app from Google play store if not installed already. This is perfect tap to pay payment method. Most of us carry credit cards, debit cards while travelling or shopping that is not always safe, secure, and comfortable. To get safety, security, and comfort you can using Android Pay app and replace your credit/debit cards. Before using Android Pay app first you need to add your cards on your NFC enabled android device running Kit Kat 4.4 or above using Android Pay App. You can download Android Pay from Google Play Store. When you add your card to Android Pay then at the same time you are also adding your card to Google Payments. 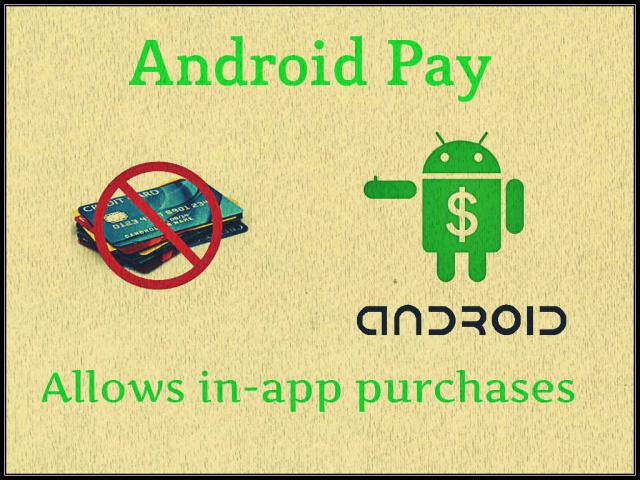 This will help you to buy anything either from Google Play Store and online Google using your cards. Once your cards have been added and verified then you’ll be ready to make payments. You can only use android Pay app that where contactless paymentsaccepted, so to make payment you must hold your device near the contactless reader until device beeps and indication appears on the screen to show payment completed. Android pay is only facilitating in Australia, Singapore, United States, and United Kingdom. Here is a list of supported banks whose credit/debit cards are eligible for Android Pay. Bank Of Scotland, First Direct, Halifax, HSBC, Lloyds, M&S Bank, MBNA, Nationwide Building Society. AMEX, Bank Of America, BBVA Compass, Chase, CITI, Discover, HSBC, NFCU, PNC, Regions, USAA, US Bank, Wells Fargo. If you want to add your card in your Android Pay app then steps are very simple. First download and install Android Pay app on your compatible device. Open Android Pay app and tap to “+” sign to add your card. You can add card that is already added to your Google account or add new card manually by entering card information or taking picture of your card. Once you have accepted terms & conditions, you’ll have number of ways to verify your identity. After this finally you’ll get confirmation message that card is ready for Android Pay. You can add multiple debit cards, credit cards, and loyalty cards. If you are using more than one device than you need to add Cards in each device on Android Pay. If you want to remove your card from Android Pay then simply you need to tap your card in the Android Pay and select “Remove Card” at the bottom of the screen. If you uninstall your Android pay app from your device without removing your card will not remove your card automatically from the Google payments. You need you remove your card first before uninstall Android App. At the time of checkout you simply press and hold power button to wake up your device and hold back of your device over the contactless reader device. You will receive a beep or vibration into your phone as a confirmation That transaction completed. For final verification you need to enter either PIN or sign a receipt at merchant terminal. When you use Android Pay then it will send only virtual account number to the merchant not the actual account number for security purposes. If anyone wants to return any good purchased using any card added in Android Pay then you can return it using last four digits of virtual account number instead the number mentioned at the physical card. If you want to know the virtual account number of your card then tap to your card in the Android Pay and see card details at the bottom. Google is looking forward to facilitate Android Pay in many more country with more and more Banks, favorite stores, websites and mobile application.